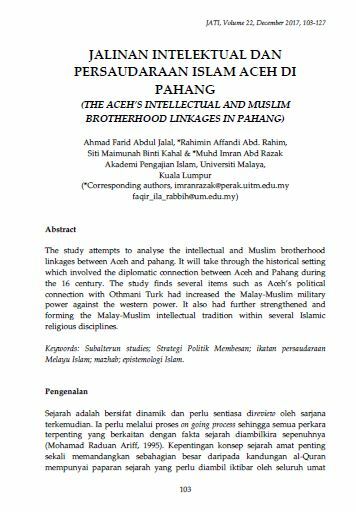 The study attempts to analyse the intellectual and Muslim brotherhood linkages between Aceh and pahang. It will take through the historical setting which involved the diplomatic connection between Aceh and Pahang during the 16 century. The study finds several items such as Aceh’s political connection with Othmani Turk had increased the Malay-Muslim military power against the western power. It also had further strengthened and forming the Malay-Muslim intellectual tradition within several Islamic religious disciplines. Keywords: Subalterun studies; Strategi Politik Membesan; ikatan persaudaraan Melayu Islam; mazhab; epistemologi Islam. ABDUL JALAL, Ahmad Farid et al. JALINAN INTELEKTUAL DAN PERSAUDARAAN ISLAM ACEH DI PAHANG. JATI - JOURNAL OF SOUTHEAST ASIAN STUDIES, [S.l. ], v. 22, n. 1, p. 103-127, dec. 2017. ISSN 2600-8653. Available at: <https://jati.um.edu.my/article/view/10249>. Date accessed: 26 apr. 2019. doi: https://doi.org/10.22452/jati.vol22no1.8.